Heavy Duty Sand Blast Suction Dredge Hose for Grit and Cement which is also called grit suction hose, sandblast suction hose, sand suction hose, cement suction hose, dredge suction hose, quarry suction hose, slurries suction hose, sewage suction hose etc. Which is ideally suction hose designed for heavy duty suction or transfer in industry applications. Widely used for heavy duty suction and delivery of water, oil, grits, cement, slurries, sewage, sand, gravels in surface mines and quarries, constructions, pump industries, dredging equipment, shipyards, ports, bays and other industry applications. 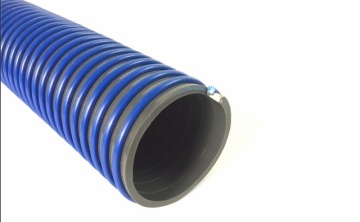 Constructed with flexible and abrasion proof PVC hose, reinforced with heavy duty helix rigid rib, smooth inner prevents materials blocked, corrugated surface provides good abrasion resistance. Excellent flexibility, crush resistant, oil and weather resistant, UV resistant, smooth inner prevents materials blockage, corrugated surface make the hose with good abrasion resistance, rigid helix reinforcement provides high pressure resistant, various lengths available and easily assembled with different couplings and clamps, ideal replace for bulkier and heavier ply-wrapped rubber hose. High temperature will reduce the working pressure.